Another day of warm and cozy ideas. 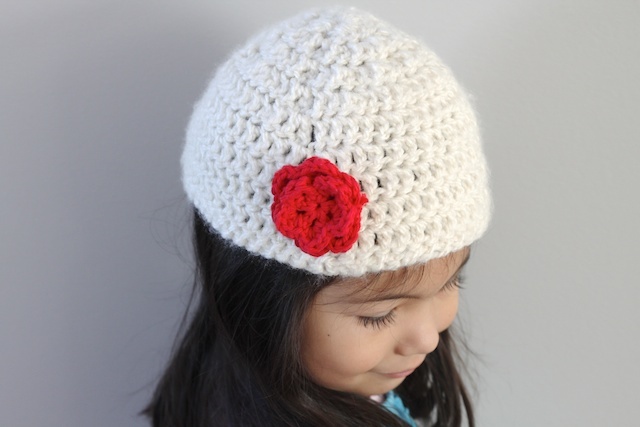 Today is the crochet flower hat for children. I put this together also pretty quickly. The flower is a little flair that I like to add for some color. And one for the little one too. Great way to keep their little heads warm when we are out and about in the cold. And guess what. So yesterday we were covered in 5 inches of snow here in the South. And today, everything is icy. This means another day of staying at home. School is canceled and offices closed. Nathan has been home with us for two days now. I love it. He has been working from home, but it’s nice having him around. » Tell me… Do your children wear hats? Do they like it? I can’t seem to keep them on my children’s heads. 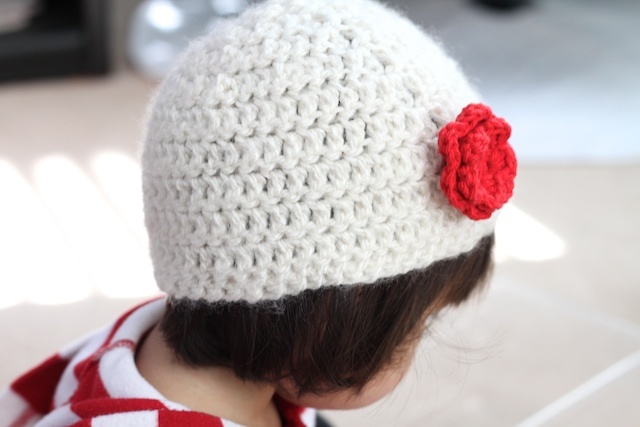 My daughter loves hats. She will even empty out her brother’s scripture tote and put it on her head with the handle up under her chin. I have pictures too. um, that hat is the cutest thing i’ve ever seen. great job! jack needs more hats, i should really try crocheting again. and if you need another cold-weather craft to do while you’re stuck inside, make some valentines 🙂 http://the-stationery-place.blogspot.com/2011/01/handmade-valentine-swap.html you know you want to. Too cute Tiffany! I need a tutorial! My son used to dislike hats, as a toddler I used to get hats that had a velcro strap to keep it on his head. When he got older buying hats with Characters he likes seems to work. This year it is Mario Bros, last year Starwars. I can usually find them rather cheap at Walmart or Burlington Coat Factory. Of course he wants a shirt to match and now he asked for his underwear to match also lol. Another day I wish my knitting skills weren’t so rudimentary and my crocheting skills non-existent (sigh). We lived in Nashville for 5 years and (being from the northwest) were amazed when they’d shut down the schools even when snow was only predicted! I am obsessed with hats on my girlie and she normally does pretty well keeping them on. She was so bald until just recently, that I did hats to enhance her girlyness — tired of strangers thinking she was a boy> 🙂 Love your flower hat! SUPER cute. Wish I knew how to crochet, but that might have to be next year. This year I got a sewing machine, and that’s my New Year’s resolution.